"There's something immensely gratifying about crossing the line into a new state and being immediately confronted by evidence that this place is culturally unique," writes Badger, who intuitively understands the vital importance of entryway to creating Place. If our entrance to a state is created by a stop at an Exxon or McDonald's, we may as well be anywhere. Rest stops, on the other hand, give states a chance to show how they're different. Hence we have teepee picnic shelters in Oklahoma, oil rig motifs in Texas, and Spanish pueblo bathrooms in New Mexico. They give states the opportunity to make an impression on travelers; "to give the pitch about how Virginia is for Lovers, say. Or about how 400 years ago 103 men and boys crossed the Atlantic in three ships to found English-speaking America here." Perhaps more importantly, they provide a place for people to get out, stretch their legs, walk their dogs, and look out over the surrounding landscape rather than drive past behind glass and steel. "Mary" felt strongly enough to write in a personal comment about the article: "My family traveled a lot over the past 20 years," she writes, "We counted on the rest areas. In fact, the kids would bring skates or jump ropes and burn off energy so they could endure more car time. 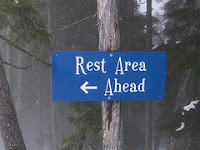 Without rest areas, traffic fatalities will go waaaaaaaay up. The poor kids will get yelled at by their parents. But worst of all the pets will suffer; they can't run around at Mickey Deeeeze." Mary's very human reaction is one of the best summaries I've seen about the effect of No Place on our everyday lives.